These are the English editions covering Austria, Austria-Hungary, Germany and also the "Eastern Alps" (corresponding to the German S�dbayern editions), eventually becoming Tyrol and the Dolomites. 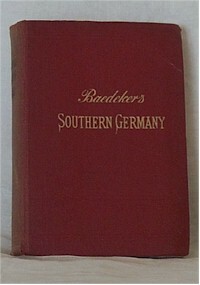 There are separate pages for the German editions of Germany in a single volume, Austria and Southern Germany, Northern Germany and Southern Bavaria and Tyrol, as well as for French editions on Austria and Germany. In addition, Berlin is treated on a separate page. These books are particularly notable for many panoramas of the Alps. The final edition on Germany was published together with German and French versions on the occasion of the Berlin Olympic Games in 1936.